One of our biggest challenges is trying to keep up “with the times” while preserving and respecting our wonderful old building. For instance, as the business grew the dining room and classrooms of Beaumont College became the dining rooms of Beaumont Inn. The office of College President/Owner, John Augustus Williams, became the kitchen of Beaumont Inn. Porches became gift shop and more restaurant spaces, carriage storage and “garage” became Old Owl Tavern and so on. And now we have just completed another transformation—the back room of the Gift Shop has become Dixon’s Bourbon Tasting Room! 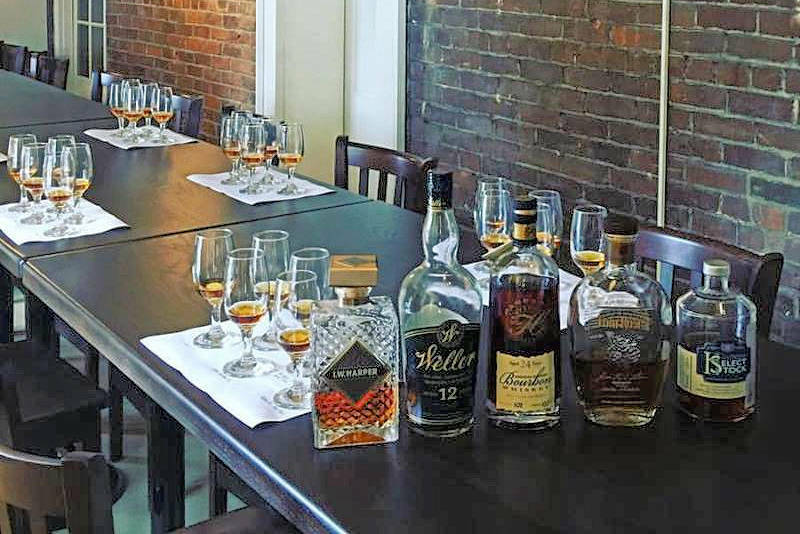 For the last several years Dixon has been offering private bourbon tastings for those who want to know more about bourbon, want to talk bourbon or try some different bourbons. These have been very popular but at times it has been a challenge for Dixon to find a place to “hold court” and store glassware, etc. So Gary Lay Construction took pegboard walls and paneling off to expose original brick walls and columns in the back room of the Gift Shop. (The shop is forever changing!) Do you remember the Durr house that you passed when you entered Beaumont Inn property from US127? It was torn down but we saved many of the doors and windows. We used two of those doors for the entrance to the Tasting Room. 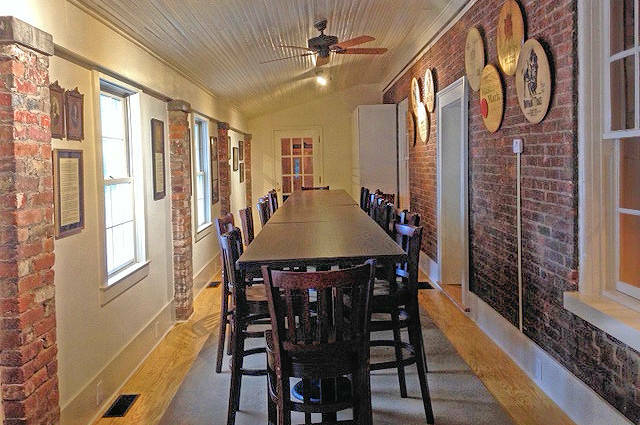 Dedman Family Distilling history is displayed on the walls as well as Bourbon barrelheads. An attempt to create the family distilling “tree” is displayed which might need a little tweaking. New beautiful tables and chairs have been added. In the process a small alcove was created in which we have added one of the bookcases used in the classrooms of the college. This case is filled with books we have read and want to share—take a book, trade a book, send back a book, just enjoy a book. Yes, you need to come see it, book a tasting with Dixon and choose a book to read while relaxing on the Front Porch! On the horizon is the long overdue book of the history of Beaumont Inn; this book as been a goal of ours for years. At one time Chuck and I thought we could get it done ourselves, but decided the best thing to do is turn the project over to our good friend, John David Myles. He is a master at deed and history research. We are very excited about the book which is at the printer’s as we speak! Look for that announcement later in the Fall! So there is more for you to see and do the next time you visit. We look forward to it!